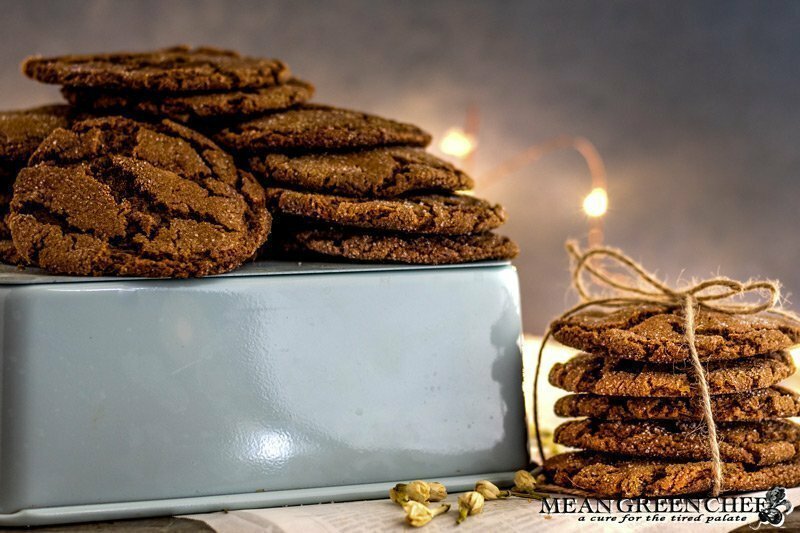 Our Best Ever Molasses Cookies have a dreamy soft center with a lightly crunchy exterior. A delectable blend of flavors that create the perfect spiced cookie. And they come together in a snap! After resting in the fridge the dough is rolled and then coated in superfine sugar to produce a crispy crunchy bite that immediately gives way to a soft tender center. Glad you asked, a little food nerdery ahead! Molasses is produced from crushed sugarcane. In a similar process to creating olive oil, the first extraction has the lightest flavor and color. While the following batches increase in color and become hardier in flavor. After the sugarcane is pressed, the juice is gently boiled down so the water begins to evaporate. This process creates a thick, sweet cane syrup. The juice is then brought to a vigorous boil, which causes more of the water to evaporate increasing the flavor, acidity, and mineral content and the syrup crystalizes. The crystals are then extracted as raw sugar, leaving dark mineral-rich molasses. The rich dark color and flavor of molasses are thanks to the Maillard reaction which occurs when the fructose and glucose brown during the cooking process. Use Dark Molasses! Light molasses does not pack the flavor punch of dark, and Black Molasses is bitter, too thick and does not allow the cookies to bake correctly. Use shortening! You don’t make these all the time, make them the right way. Don’t sub butter or margarine for this recipe. While butter is delicious, after years of making these cookies, shortening produces a light, fluffy beautiful cookie. The cookies are finished baking once the edges are set and they start to crack on top. When you remove them from the oven they will have a wet sheen on the tops, it’s normal. Take them out and allow them to sit on the sheet pan for 5 minutes, they’ll finish cooking and firm up while resting. Add the shortening, light brown sugar, dark brown sugar, and eggs to a large mixing bowl. Beat on medium-high speed until creamed, light and fluffy about 2 minutes. Beat the molasses until well blended, about 2 minutes. Fold in the dry ingredients and stir by hand until well incorporated. Cover and chill for 2 hours in the fridge. Preheat the oven to 350°F/176°C line a sheet pan with parchment paper and set aside. Roll dough into small balls and then roll in the reserved 1/2 cup (100 grams) of white sugar. Place on the parchment lined baking sheet and bake for 9-10 minutes until the cookies begin to crisp slightly in the outside, crack and you can see a soft center showing through the cracks. Remove from the oven and allow to cool on the sheet pan for 5 minutes, then remove to a rack to cool. Store cookies in an airtight container in a cool dry place, cookies will remain fresh up to a week. If you’re looking for some other great cookie options, please check out our other recipes! We 💙LOVE💚 seeing your creations! So don’t forget to tag us @meangreenchef or #meangreenchef so we can see what’s happening in your kitchen!